Existing home sales fell for the third time in the last four weeks according to the weekly National Home Sales Snapshot released by DataQuick while home prices remained unchanged from the previous week, the third consecutive week prices have remained flat. There were 215,156 properties sold over the previous thirty-day rolling period ending August 16th, down 1.3 percent from the previous week’s total of 217,931 sold properties and 2.4 percent lower than the 220,425 properties sold four weeks ago. Sales volume was 12.5 percent above the previous year’s cycle peak of 190,934 sales which occurred during the 30-day rolling period prior to September 1st. Last week’s home sales volume was 11.1 percent higher than the 193,715 homes sold during the same period a year ago and was 2.3 percent higher than during the same period three years ago when 210,285 homes were sold. 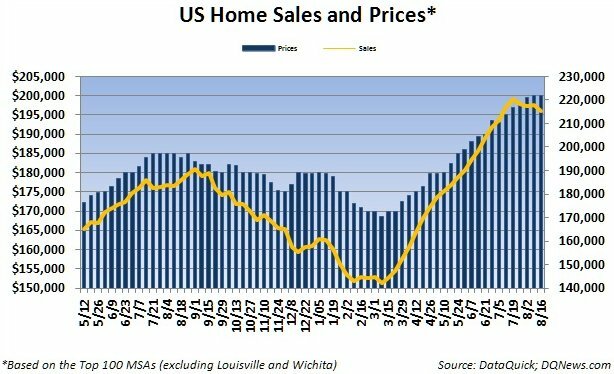 The median price of a home sold over the current thirty-day rolling period remained unchanged from last week at $200,000 and was 1.5 percent higher than what it was four weeks ago when the median sales price was $197,000. Home prices were 5.3 percent higher than the same period a year ago when the median price of a home was $190,000 and were 4.8 percent higher than what they were three years ago when the median price was also $190,900. It was the 19th consecutive week that year-over-year home prices surpassed the previous year’s levels. Over the last five years, median home prices nationwide have ranged from a high of $275,000 to a low of $168,500. Home sales volume over the last five years has ranged from a high of 339,669 properties sold to a low of 124,051.